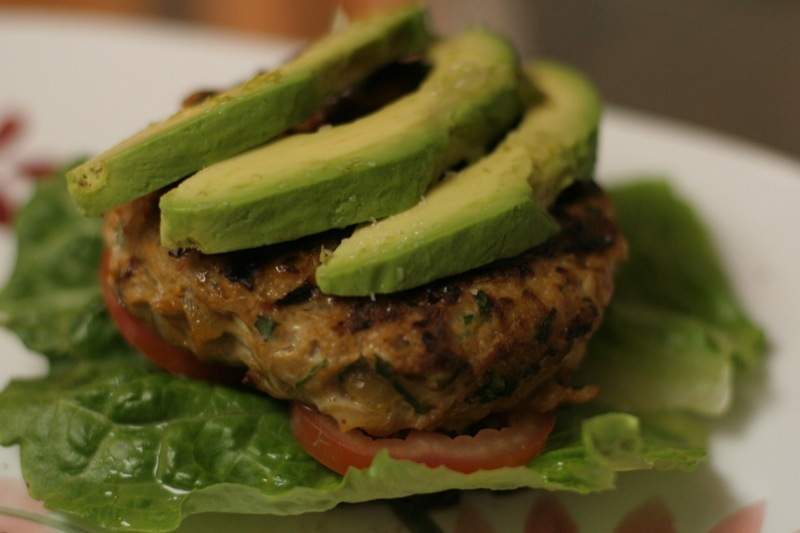 These are lovely, flavorful no-carb chicken “burgers.” (Don’t worry. The ” ” come in not because the chicken is fake but because there is no bread part of the burger. But they still taste awesome!). Apart from all the delicious spices in the burgers themselves, they get a huge flavor punch from all the fixings. I serve them on top of roasted portobello mushroom caps with lettuce, tomato, and avocado. The final kick comes from zest-and-squeeze of lime on top! They’re a very filling summertime meal. 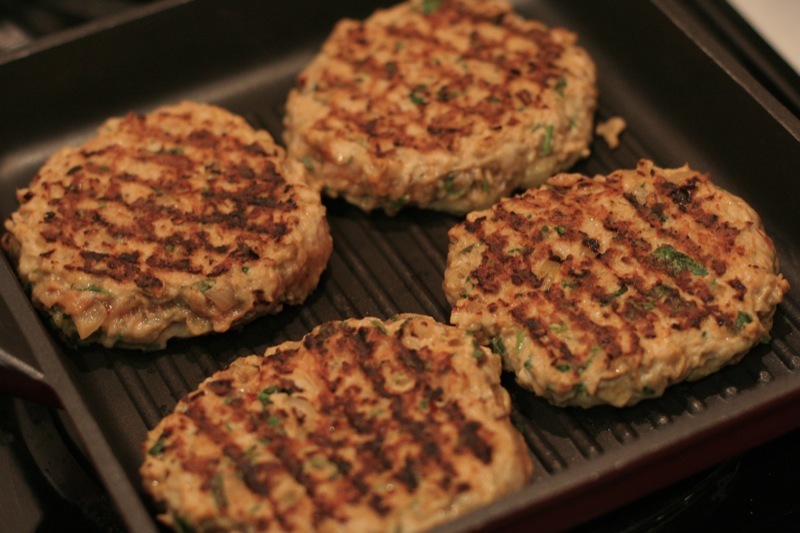 For these patties, I use a flavor mixture based on Smitten Kitchen’s chicken meatballs. My version has a few more spices, and I make it in meatball, kabob or patty form. I’ve made it without breadcrumbs or bread soaked in milk, and the meatballs/patties still are quite moist because of the egg, onion, and tomato paste/ketchup (and no-carb!). Real-life tip 1: I make many batches of this spiced ground chicken mixture and freeze it. That way, when I’m ready to make meatballs, I can just pull it out. It actually also works well as a head start when making chili or other sauces – just brown the spiced meat as you would un-spiced ground meat. Real-life tip 2: For super fast weeknight meals, go ahead and form the meatballs or patties and stick them in the freezer till they’re frozen solid. Then, you can just pop them into zip-top bags and pull them out when needed! Sautee the onion and garlic till the onion is lightly browned. Puree until smooth. Mix together the pureed onion and garlic mixture, dry spices, tomato paste/ketchup, chipotle, egg, and chopped herbs. Mix all of these into the the ground chicken. If you’re forming meatballs, put a dot of tomato paste or ketchup on top of each one before you bake them. For this burger, just form them into patties (about 1/4 cup of meat per patty) and grill on a grill pan. I think it’s about 3-4 minutes per side. 1. 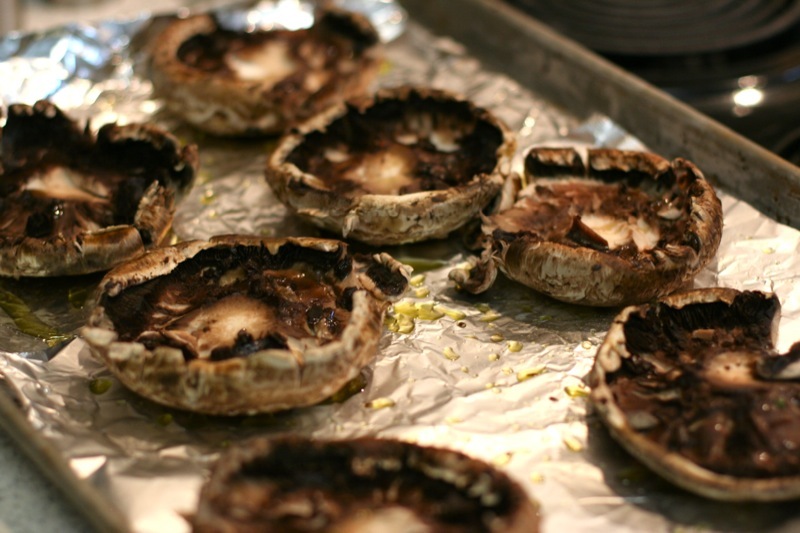 The portobellos: Scrape the gills out of the portobello mushroom caps. They’re rather unedible. Just use a spoon and drag it (gently) across the bottom. Fun fact – portobellos are just grown-up cremini mushrooms with a much stronger flavor…… and grown-up inedible gills. Drizzle them with olive oil and a sprinkle of salt and pepper. Place them on a baking sheet and broil in the oven for just a few minutes until they start to soften, but still hold their shape. 2. 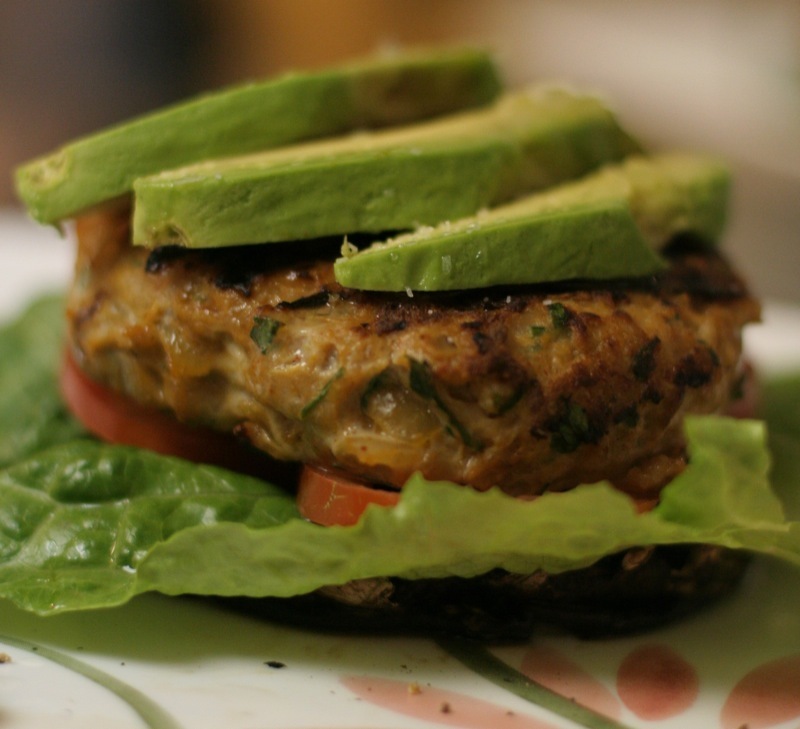 Assembling the burgers: Portobello cap (one or two) + slice of lettuce + slice of tomato + chicken burger + slices of avocado. Yum. I like to add an extra kick of flavor (and keep the avocado from turning brown) by adding a quick “dressing” of lime zest + lime juice on top. ummm… i eat the gills. am i weird?